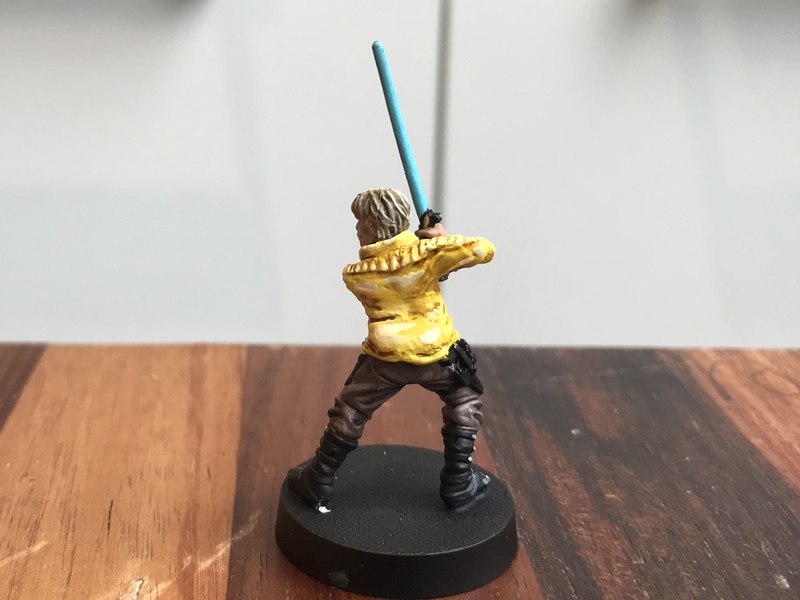 Now that I've settled into some Legion creativity after my time painting Armada I thought I would create a thread here. 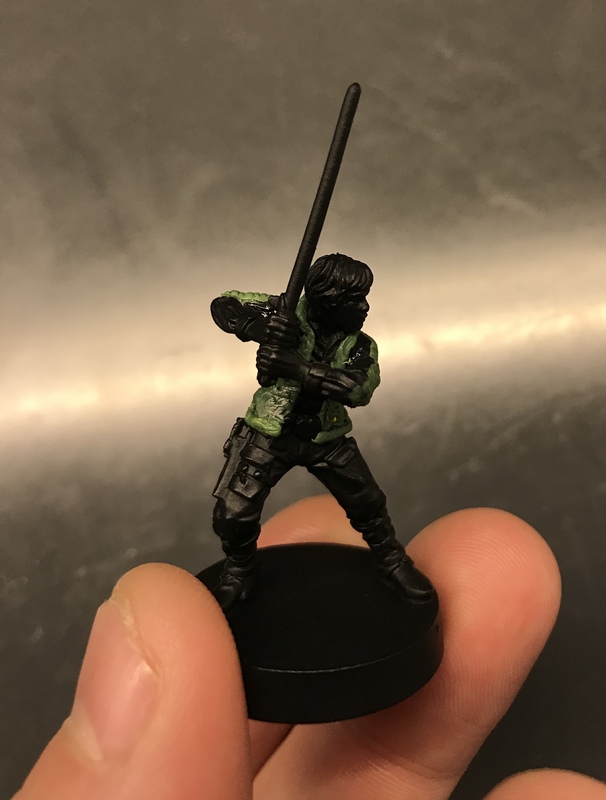 I won't be posting too many paint jobs as mine aren't terribly impressive, but I've begun lending my hand to converting the mini's to make my arms unique. Pretty surprised I haven't seen a rendition of this out in the world yet. One my my favourite outfits. Luke's award ceremony jacket from ANH, and his main outfit in the new Marvel comics. The lightsaber blade will be replaced with the neon plastic transparent rod which why it is mostly unpainted. Just a basic head swap for my Durosian friend. 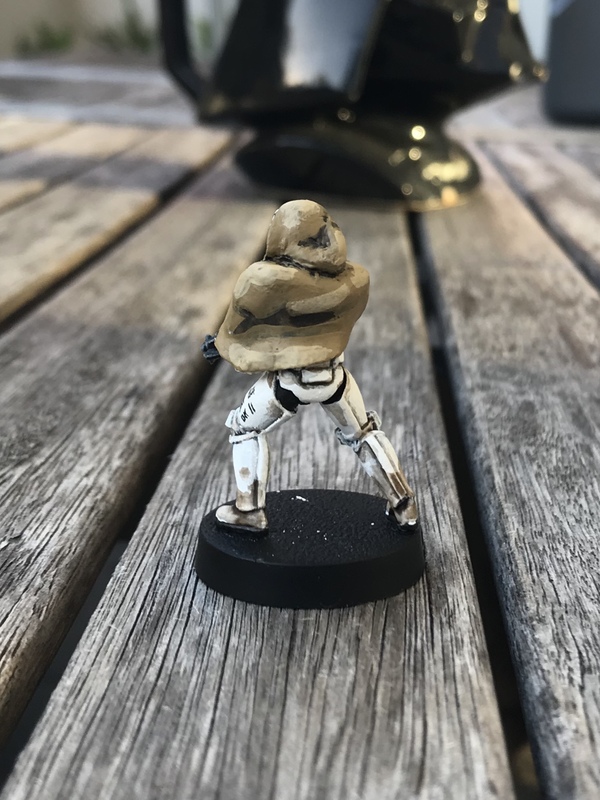 For my Veteran Stormtrooper Captain I removed his head and hollowed it out, and repositioned his arm to be holding it as a helmet (painted battle damage). 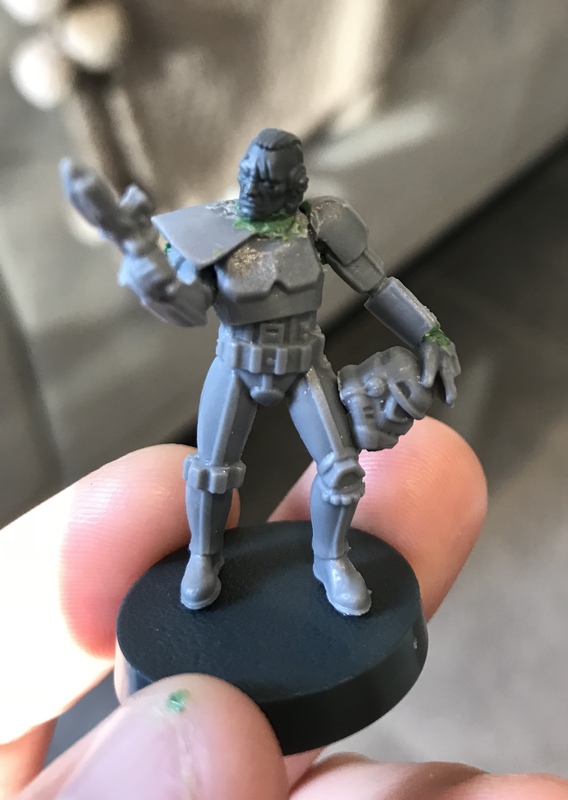 The head was a spare from a friends 40k Marines, and I picked the most Star Wars-y head available ( a little bit of Lobot cybernetics). His squad will be a heavily converted squad of veterans left deployed planet-side without support for too long, and gone a little war crazy. Upcoming are decorated heavy weapons specialists, poncho wearing stealth troopers and heavily laden supply experts. Congrats on the Veteran Stormtrooper, he rocks! Great idea for the stormtrooper, and l love the Luke conversion! I like the stormtrooper mod, but it kind of looks like he is wearing a bib. It's worth mentioning that prior to that Luke above, I've never used Green Stuff before, so excuse some of the funky practices and dodgy appearances as I stumble my way through this. 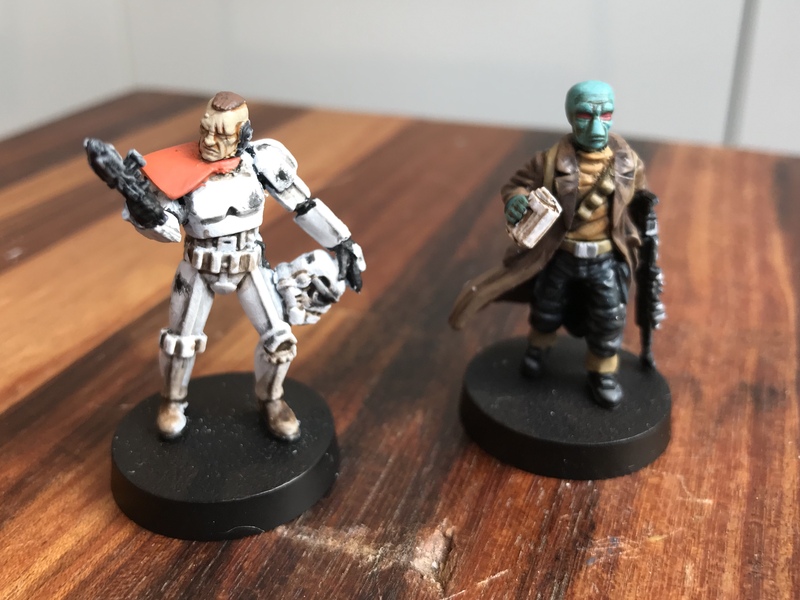 Next up for the squad of veteran Stormtroopers to accompany the captain above, I've tried a couple more conversions. 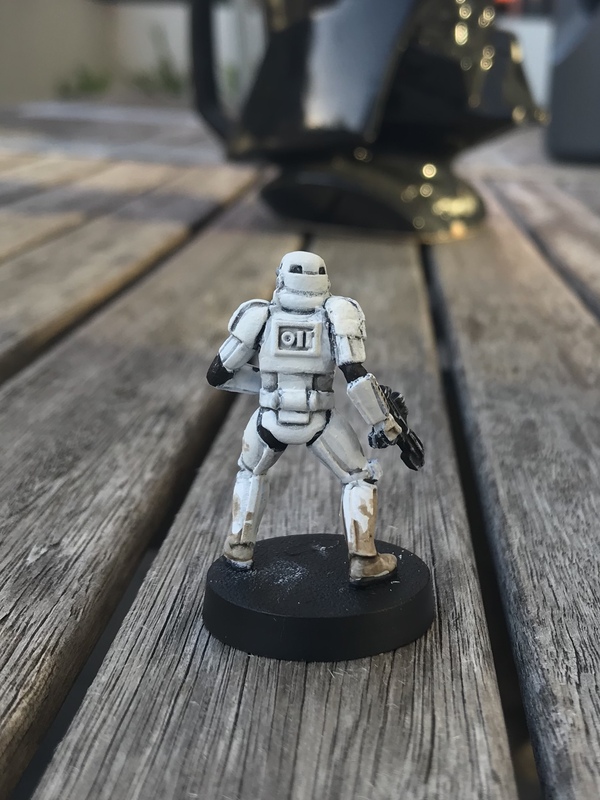 This Stormtrooper unit have been left on Jedha after the Death Star's test firing, keeping order on a lawless world and abandoned by the Empire. 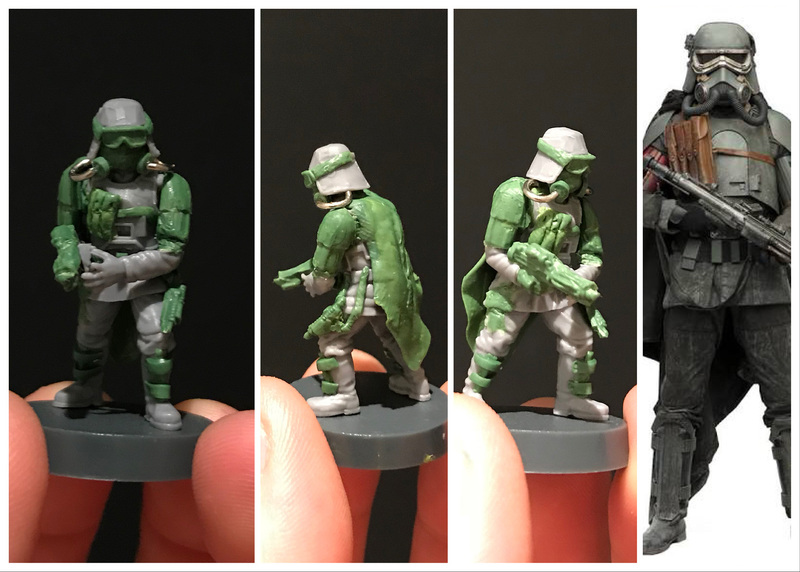 Influenced in part by Eadu, and partially by the upcoming Mimban troopers, I wanted to reflect a trooper used to adverse weather. 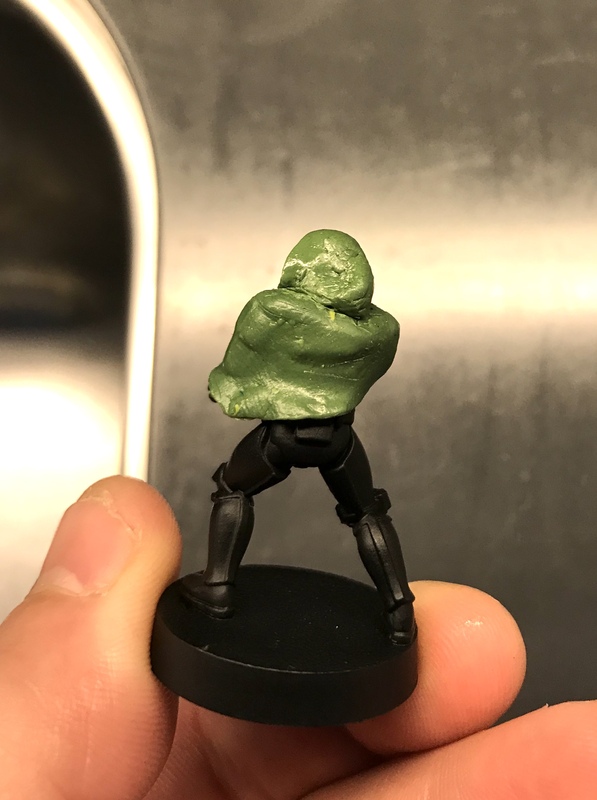 I *sculpted (*using this term very loosely) a Green Stuff poncho and added an additional sight to the troopers E-11. These troopers feature a lot more of a weather look than my other trooper units, with no gloss on remaining on their armour. 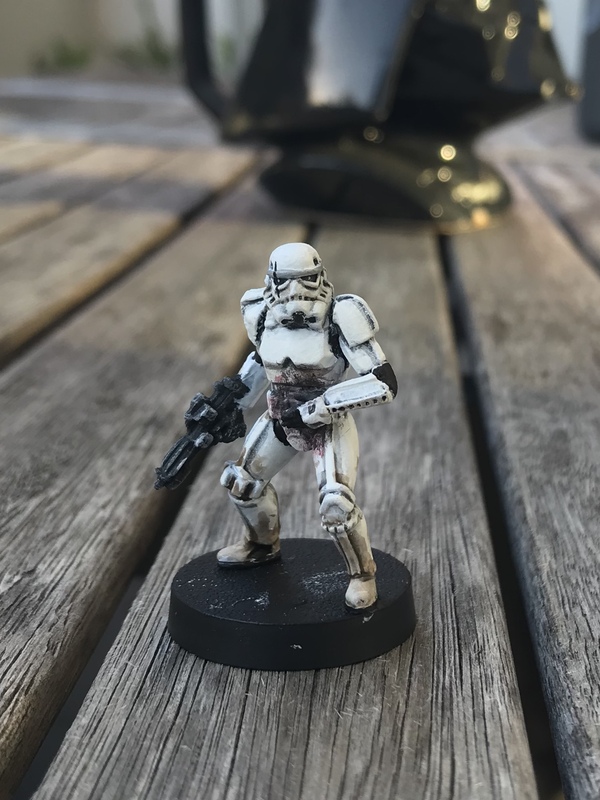 As this trooper is the marksman of the unit, I thought it would be a nice idea and further visual identifier to include his kill count on his armour, which he has scratched in as the uniformity of the Empire drifts further and further from his mind. 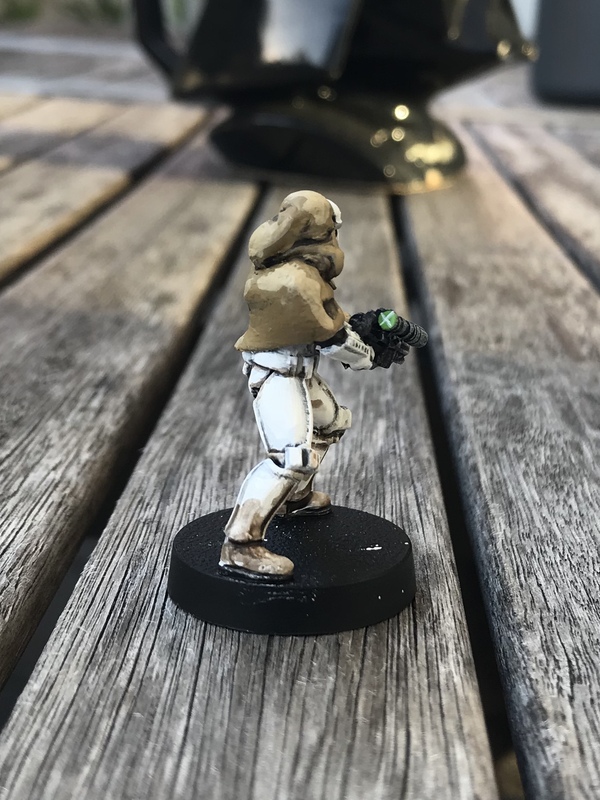 With a set of squad leader arms remaining from an earlier conversion I figured I would give a regular trooper an alternate stance. This trooper cradles a large shot in the stomach as he fights on with no hope of reinforcements. I'll be basing this squad on broken statues, marketplace banners and lots of sand. more pictures to come. I've also spent the weekend working on their accompanying AT-ST which I'll post pictures of soon! Well, you're doing pretty alright so far! They look really nice and I like your theme. @ABXY @Bohemian73 Thank you so much. Appreciate the kind words! @thebigeb2589 Haha thanks a lot. Definitely getting better. I had totally thought about SCAR squadron members as well. 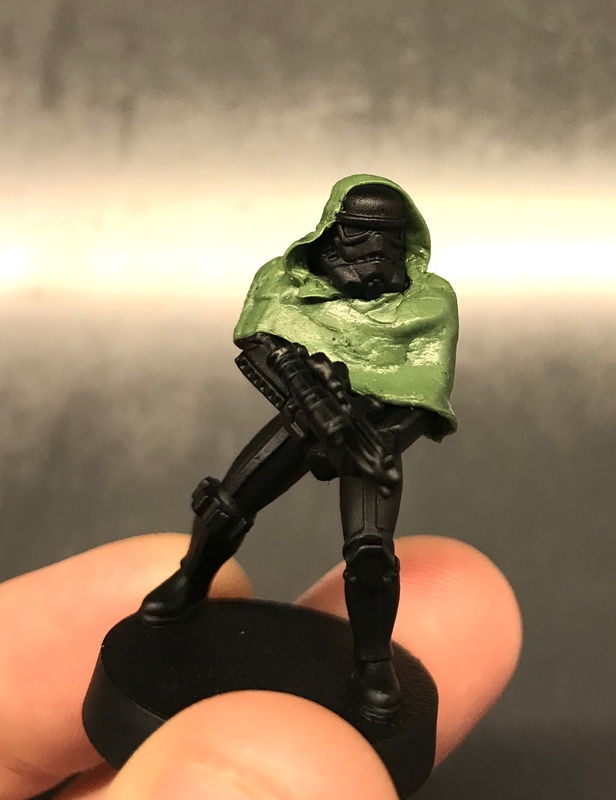 I believe his is more of a full length cape, but I definitely took inspiration from the canon of a stormtrooper with a hood on from those comics. 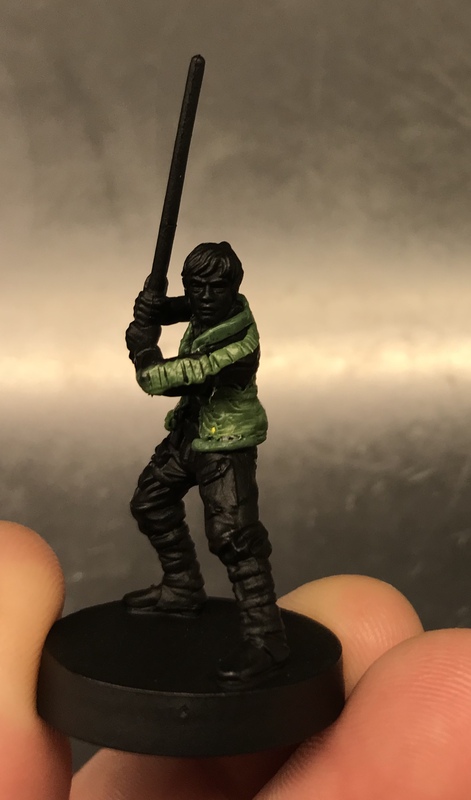 From one new guy to another ... solid effort with sculpting stuff first time out. Well I suppose the time has come to start documenting the conversion of my Jedha AT-ST. 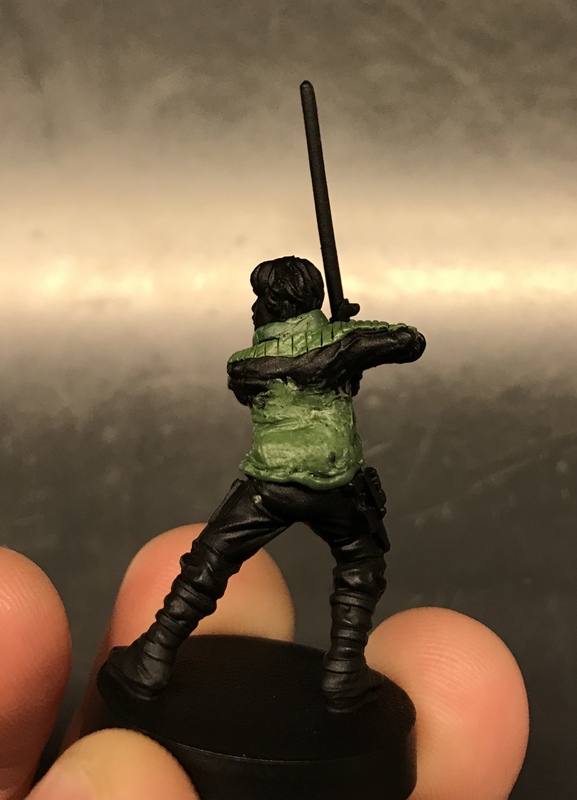 Matching the concept of the veteran troopers above, I wanted to depict a walker left stationed on Jedha in an abandoned garrison after the Death Star's test firing. The walker would be a mobile base station, like WWII tanks, so I wanted to create an appearance of heavy utility. To make the AT ST standout and convey the theme I sculpted numerous tarps and bag rolls out of green stuff. This was a combination of scratch building, as well as taking molds of the Speeder Bike bag rolls for easy reproduction. I also took a mold of an old LOTR terrain piece, to add to the base of the AT-ST as some toppled Holy City statue detail. Next you can see me start to lay out the pieces to determine what will fit to the head (I hadn't finished the ropes holding the front roll yet). 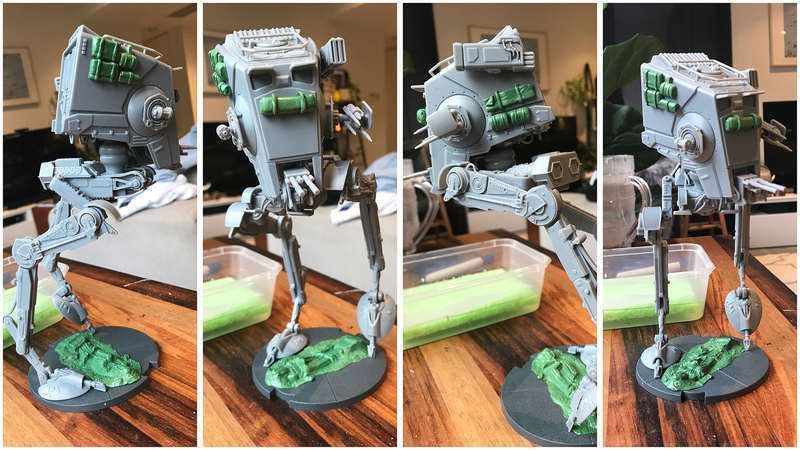 And here is some shots of the final pose, terrain & conversions on the walker, ready for priming. Can’t wait to see that ATST painted. May I suggest this stuff instead of green stuff. It is just like clay, can be smooth and sculpted with water and probably cheaper by the pound. Amazon sells this stuff but Tap Plastic is a great place to order all kinds of plastic modeling stuff. I've think I'm done with this for now. 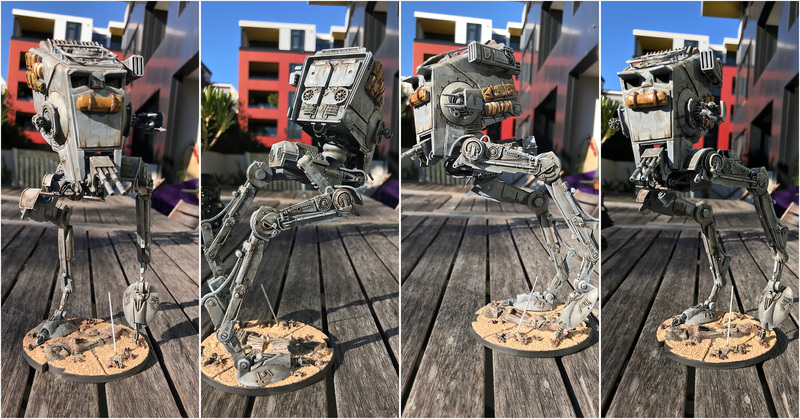 I've heavily washed and weathered the left behind AT-ST. Really happy with how the rust and dirt stains have turned out, especially on the back. All that's left to do on this bad boy now is to create a torn up shop shelter out of Green Stuff and have it stretched across the support pole you can see on the base. 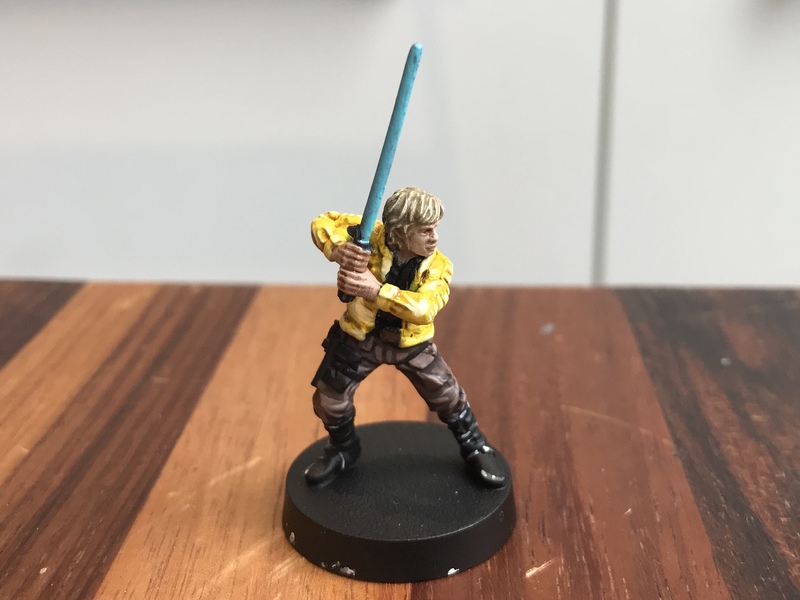 This guy goes well with my completed Survivors of Jedha veteran squad, which I'll snap some pics of when my lightbox arrives! Wow, I love it! It's got a real Afrika Korps feel to it. I have to ask, though, did you do anything to counterbalance it? Weights on the base, perhaps? The pose is fantastic, it really captures that mid-stride look but the model looks terribly unbalanced for tabletop use. I love how off balance it looks, but I too wonder about stability. It's actually surprisingly stable despite the stance! I have no stability issues with it whatsoever and with display or movement it has never fallen over. You can feel that it is very slightly front of centre heavy, so I may eventually counterbalance it so it just feels a bit nicer to hold, but there is no real need or rush to do it. That Luke is impressive! 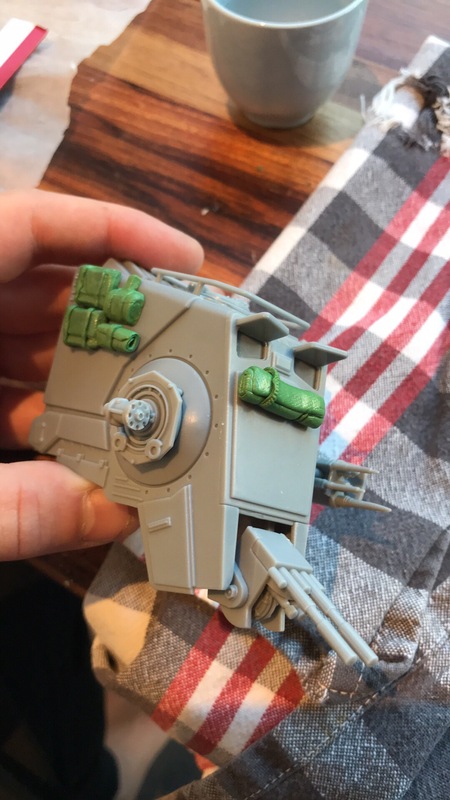 Nice conversion work! You can get GS pretty cheap if you buy the big rolls on ebay rather than the tiny GF9/GW packages. That said - use both; when mixed you get the positive qualities of both putties plus extended work time. Any of the "clay-ish" epoxies will work; Magic Sculpt, Milliput Fine, Apoxie Sculpt(I use Apoxie myself because I got a good deal on some). I'd use vaseline rather than water though, less messy. Also, if you don't yet have them OP, grab some rubber-tipped brushes(typically named colour shapers, sometimes clay shapers). Nothing improved my sculpting - except for practice, obviously - more than those, they handle cloth, musculature, and general smoothing and blending so much better than the basic metal tool most folk start with. To start I'd recommend Black(firm) Size 0 Flat Chisel and Taper Point, Grey(medium) Size 0 Round Cup and Size 2 Flat Chisel, and White(soft) Size 6 Flat Chisel and Round Cup. Regardless, loving your theme, makes them nice and individualised without having to deviate from the "proper" colourscheme. @Yodhrin I never tried vaseline before and would never consider it less messy, but it could work on fine details. Thanks for the recommendations! I had never seen the rubber brushes until they popped up in a video I was researching yesterday and they look great. I'll absolutely be jumping on some soon, and also be looking into your suggestions on mixing putties. At the moment I buy the cheap large rolls of Green Stuff on ebay. Thanks for the kind words. I'll keep trying and hopefully continue to improve! 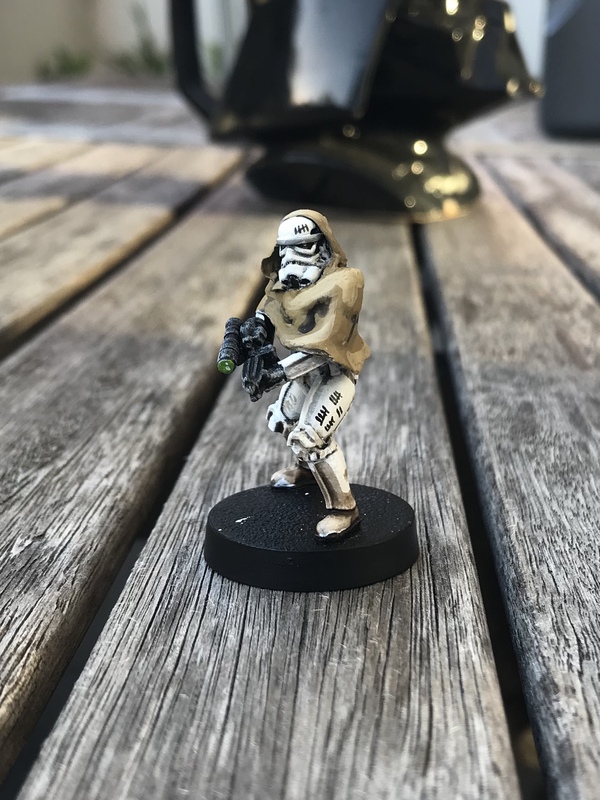 Also for those excited about the Solo launch today, here's a dodgy Mudtrooper from the Veers model! When compiling this pic I realised I had the breathing hoses in the wrong place, so I redid those this morning with Green Stuff instead of paper clip! Will also be working on the cape to give a better shape and removing the fingerprints.